Donnie Gene Mullikin, 85, Excelsior Springs, Mo. 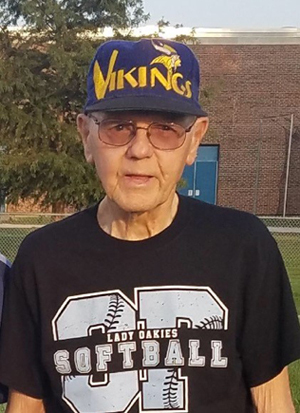 (Wood Heights), passed away peacefully in his sleep on May 22, 2018 surrounded by his loving family. Donnie was born June 17, 1932 in Excelsior Springs, Mo., to Franklin and Mary Fern (Patton) Mullikin. He served in the Army during the Korean War. Donnie worked for Trailmoble for 20 years as a welder which he was very skilled at. He later worked for Warehouse 1, retiring after 17 years of welding in 2008. He loved the outdoors and loved to hunt, fish and be outside in his yard doing yard work and also piddling around in his work shop. He loved his Minnesota Vikings football team as well. Donnie met and married Agnes Jones of Glenolden, Penn., in 1954. Donnie is survived by his wife of 63 years, Agnes; five children, Mike (Altas, Okla.), Laura (Emporia, Kans. ), Sharon and husband Mike Griffin (Excelsior Springs), Matt and wife Debbie (Excelsior Springs), and Lenore (Gladstone, Mo. ); siblings, Dean (Virginia), Sue (Texas), Lanny (Holt, Mo. ), and Danny (Excelsior Springs); five grandchildren, Stacey, Jason, Angela, Amanda, and Olivia; nine great grandchildren, Mason, Kaleb, Kyree, Mackenzie, George, Brayden, Lilliana, Maverick, and Max. Donnie was preceded in death by his parents, Franklin and Mary Fern; grandparents, Mike and Suzie Maletta; brother, Michael Wayne; and granddaughter, Tiffany. A memorial visitation will be held from 11 a.m. to 12 p.m., Saturday, May 26, 2018 at Bross & Spidle Funeral Home, Excelsior Springs. Please accept my most sincere condolences on your loss. I know the entire family will really miss Donnie. I’m praying for you all. I’m unable to attend services as I’m currently visiting my grandson and his family. Agnes, if you ever want to talk, feel free to call me. I am so sorry for your loss. I know your dad is in Heaven and has his mansion. I believe Jesus said,”Well done, my good and faithful servant.” He loved his children, his wife, and grandchildren. He was proud of all of you and he’s still watching over you. It’s not goodbye, it’s until we meet again. I know no words can take the pain of losing him away, but know he lives on, in our hearts, your smiles, your lives. God bless you! !